Our BERG Team was present at the Spring Fair in Birmingham. Also Made in Birmingham TV spotted our booth there for one of their shows! 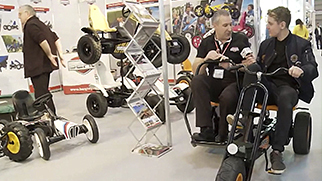 The Lowndown show made an item about the new BERG Duo Chopper BF and our other products. Take a look at this item. 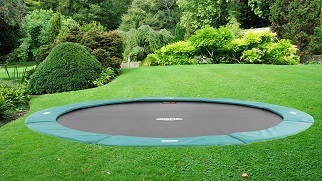 If you would like a trampoline that blends in with your perfect garden then choose the BERG FlatGround Champion. This trampoline can be sunk into your garden and integrated in such a way that it fits seamlessly in your perfectly landscaped garden. Your children do not have to climb up onto the trampoline, which makes it much easier for them. In addition, this trampoline is equipped with a unique BERG Airflow jumping mat which allows 50% more air through for ultimate bouncing fun. The special noise-reducing straps underneath the protective edge allow the air underneath the trampoline to escape. You will therefore feel very little resistance when jumping and the protective edge will not rattle against the jumping mat. The special patented frame makes the BERG FlatGround easy to assemble and install. Would you like to know more? View the BERG FlatGround Champion online here. Our new BERG Brochure has arrived! Not only does it contain our current BERG Product range, but also a number of new go-karts and trampolines that we are introducing this year. 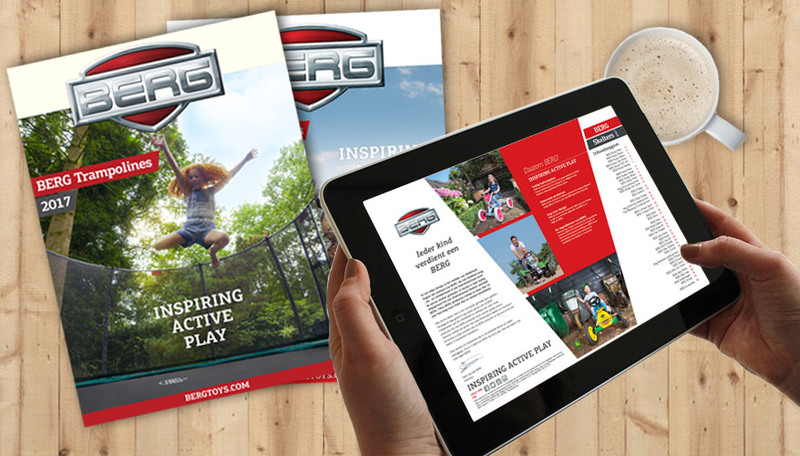 So take a quick peek at our online brochure or collect one from one of our dealers. But watch out! Before you know it your heart or your children’s hearts will be stolen by one of our go-karts or trampolines. Never too old to go gokarting! We've got proof: you are never too old to jump on one of our BERG pedal gokarts! Grandpa Gerrit turned 94 last November 7th, but he loves to go gokarting! 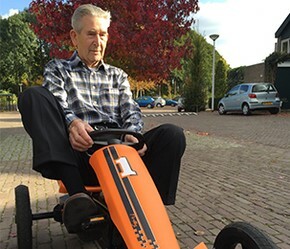 On his grandson's birthday he couldn't resist to try out the brand new pedal gokart: The BERG Rally Orange. The ultimate proof that you are never too old to have fun on BERG's pedal gokarts! A big hurray for BERG! We are happy to tell you about something great! Our BMW Street Racer has won an award! Last February we have nominated our BMW Street Racer for the Red Dot Design Award 2016 and we won an ‘Honourable Mention’! They even complemented us for our well-executed design work! The award ceremony is 4 July and we can’t wait to receive our prize! After receiving our ‘Honourable Mention’ from the Red Dot Design Awards 2016, we can be found in the Red Dot Design Yearbook, in the Red Dot Award Online Presentation and in the specially designed Red Dot App! We are very proud of this accomplishment! Which BMW is going to win? It's exciting, it's adventurous and bursting with enthusiasm! Which BMW is going to win? You will discover that this go-kart is not only fast, it also looks fantastic, it's safe and children from 3 – 8 years of age can have many years of fun with it. Check out this exciting video! New BERG Buzzy family members! YES! The BERG Buzzy family has 2 new family members! We are pleased to introduce them to you with great pride and enthusiasm! The BERG Buzzy Nitro is a really cool go-kart. The spectacular tyres, the off-road look and the perfect use of colours make the go-kart unique and spectacular. Who wouldn't want to be seen with this go-kart?! The BERG Buzzy Bloom looks really ‘cute’. 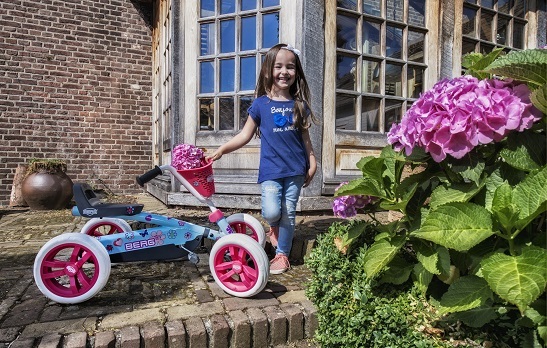 The go-kart is designed in soft colours with a matching flower pattern. The pink storage basket is ideal for taking your toys with you. The dream of every little girl and, of course, every mother. By filling in this form you will have the chance to win a BERG Buzzy Nitro or BERG Buzzy Bloom! As with all Buzzy go-karts, the steering wheel and saddle are adjustable. This makes the Buzzy's suitable for children aged 2 to 5. The go-karts not only looks fantastic, they are perfect for helping children learn to pedal. First with their feet on the ground and, before you know it, they will have their little feet on the pedals and will be tearing around the house, down the garden or around the neighbourhood! Sit down and relax and enjoy the spectacular videos of these new Buzzy's!